The gunman killed 11 people and injured at least six, including four police officers, in an attack during Sabbath religious services, authorities said. No children were among the dead. 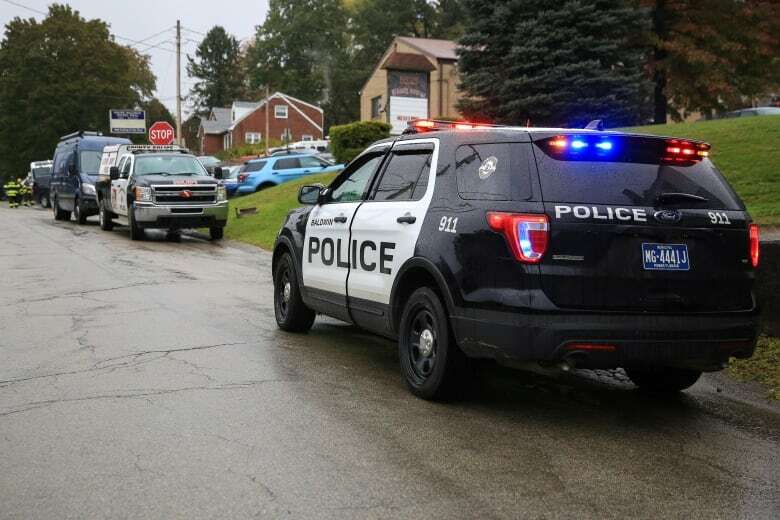 A shooter opened fire during a baby naming ceremony at a synagogue in Pittsburgh, Pa., on Saturday and killed 11 people in an attack U.S. officials are investigating as a hate crime. At least six other people were wounded, including four police officers who dashed to the scene, authorities said. No children were among the dead. 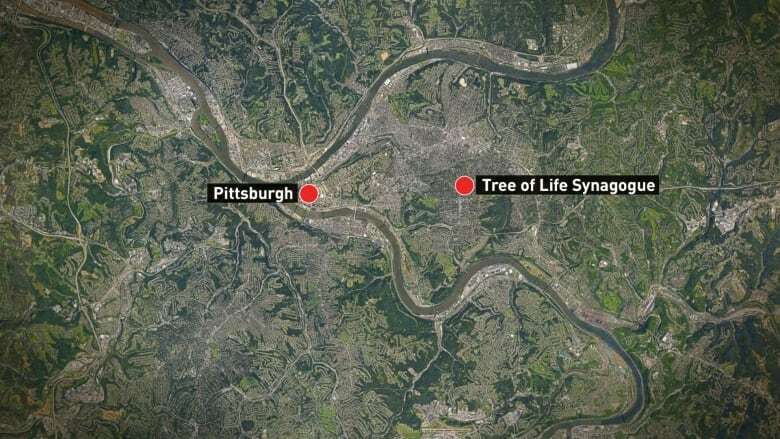 Police said a suspect, 46-year-old Robert Bowers, was in custody after the attack at the Tree of Life Congregation in Pittsburgh's Squirrel Hill neighbourhood. The suspect was taken to hospital and is in fair condition with multiple gunshot wounds, a local official said. The gunman shouted "All Jews must die" when he stormed the synagogue, according to local media and authorities. Bob Jones, the special agent in charge of the Federal Bureau of Investigation's office in Pittsburgh, said Bowers was not known to law enforcement and that investigators believe he was acting alone. The gunman used an assault rifle and three handguns in the attack, he said. "This is the most horrific crime scene I have seen in 22 years of police work," Jones said. "They were brutally murdered simply because of their faith." Federal prosecutors charged Bowers on 29 counts, including using a firearm to commit murder. Scott W. Brady, the U.S. Attorney for the Western District of Pennsylvania, announced the charges late Saturday. U.S. Attorney General Jeff Sessions had earlier said the Justice Department would file hate crime and other criminal charges against the gunman that could lead to the death penalty. "Hatred and violence on the basis of religion can have no place in our society," he said. 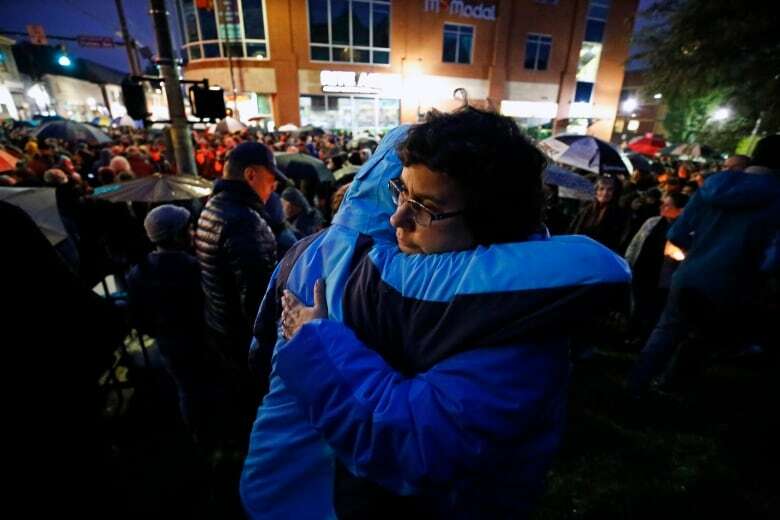 Thousands of people attended a vigil in Pittsburgh Saturday evening for the victims of the shooting. The killings come amid a rash of high-profile attacks in an increasingly divided country, including the series of pipe bombs mailed over the past week to prominent Democrats and former officials. Pittsburgh's Jewish community was shocked by the attack. "Growing up ... you hear about the Holocaust and you hear stories about other places, but you can't imagine it would ever happen in your neighbourhood," Drew Barkley, executive director of Temple Sinai, another Pittsburgh synagogue, told CBC News. "It's shocking ... We don't know why anti- Semitism exists the way it does ... It's such an ancient hatred." 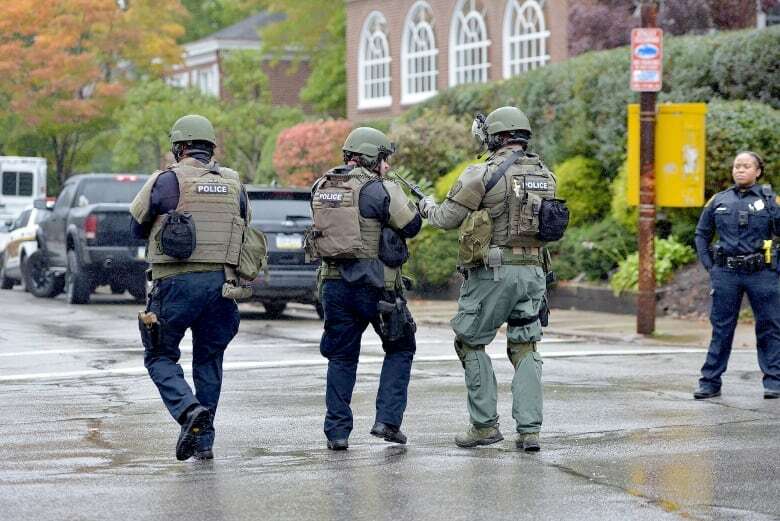 The shooting immediately reignited the longstanding national debate about guns: U.S. President Donald Trump said the outcome might have been different if the synagogue "had some kind of protection" from an armed guard, while Pennsylvania's Democratic Gov. Tom Wolf noted that once again, "dangerous weapons are putting our citizens in harm's way." "It is a very horrific crime scene. It's one of the worst that I've seen and I've been on some plane crashes," said a visibly moved Wendell Hissrich, Pittsburgh's public safety director. "Our hearts break for the families of those killed and injured at the Tree of Life Synagogue, and for the entire Jewish community of Pittsburgh," he said. International reaction poured in Saturday afternoon. Canadian Prime Minister Justin Trudeau said on Twitter: "Canadians' hearts are with the Jewish community in Pittsburgh today, as they endured a horrific anti-Semitic attack while at prayer." 2/3 We have not received information that suggests an increased security threat in Canada. That said, it is important that our community remain vigilant and follow existing security protocols. If you see something, call police. The synagogue is a fortress-like concrete building. Its facade is punctuated by rows of swirling, modernistic stained-glass windows illustrating the story of creation, the acceptance of God's law, the "life cycle" and "how human-beings should care for the earth and one another," according to its website. Among its treasures is a "Holocaust Torah" rescued from Czechoslovakia. "I ran out of the house without changing and I saw the street blocked with police cars," Eisenberg said. "It was a surreal scene. And someone yelled, 'Get out of here.' I realized it was a police officer along the side of the house. "I am sure I know all of the people, all of the fatalities," he went on. "I am just waiting to see." Eisenberg said officials at the synagogue had not gotten any threats that he knew of prior to the shooting. The synagogue maintenance employees had recently checked all of the emergency exits and doors to make sure they were cleared and working.